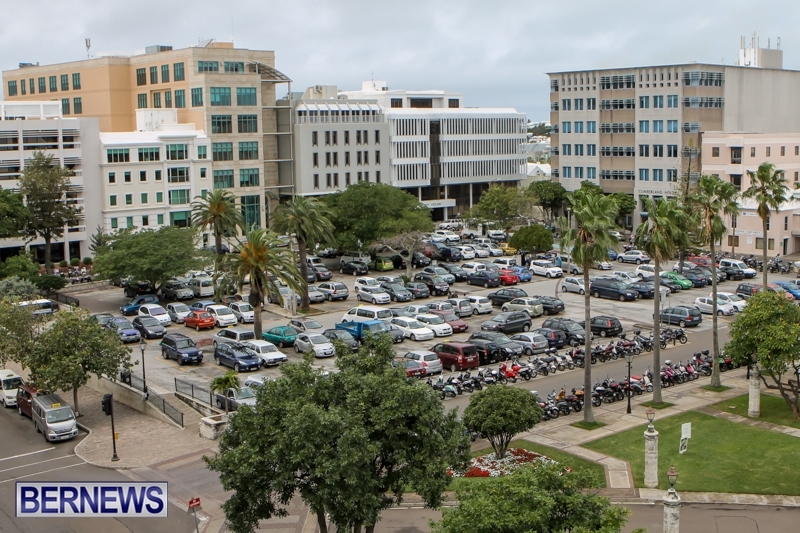 City Hall car park is about to undergo a significant change with the introduction of a ticketed barrier system to control the entry to and exit from the car park, the Corporation of Hamilton said today. “This improvement project is necessary due to low payment by users and abuse of parking durations. City Hall car park is a three hour car park and many motorists overstay the time limit,” the CoH said. “All hourly rates for use of the car park remain unchanged however customers who overstay the 3-hour time limit will be charged an immediate penalty. At 3 hours a $10 penalty fee is applied to the total amount due and at 4 hours a $65 penalty is additionally applied. “This totals the same as a $75 parking ticket, however the difference is it must be paid before exiting the car park. Mayor Charles Gosling said; “This will be a more efficient way for customers to pay for their parking and for the City to ensure compliance and payment by users. City of Hamilton Senior Engineer Ian Hind explained the improvement project will be managed in phases so as to minimize disruption to drivers, and the car park will mostly remain open throughout, with partial closure during certain phases. “Once completed, motorists will access City Hall car park from a double entry point on Dismont Drive, and exit onto either Victoria Street or Wesley Street, entering and exiting through the barrier system,” the CoH said. “The car park will be widened slightly by reducing the width of Dismont Drive, in order to accommodate 197 car bays at the regulation size, including disabled parking. Bike parking will remain on both sides of Dismont Drive and around the perimeter of the carpark. “The nine trees currently inside the car park will be relocated to the periphery and an additional eight trees will be planted within the sidewalk surrounded by tree grates. The west side will have five trees, the north side three, the east side seven, plus one each in the north-west and north-east corners. 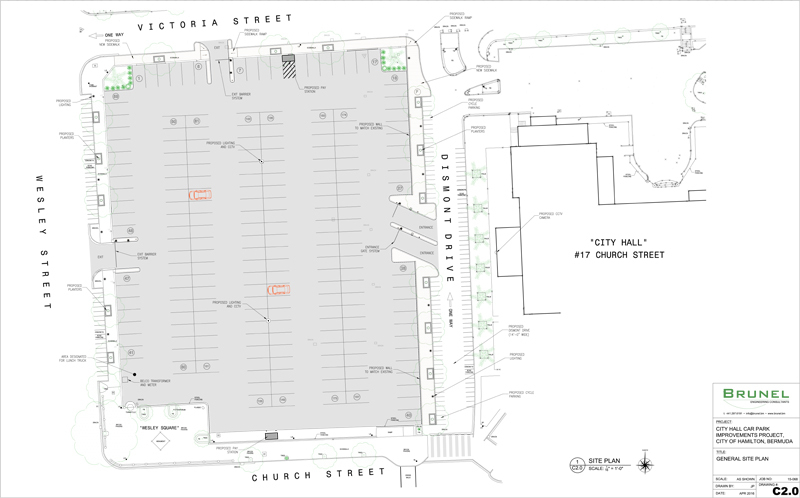 A plan of the new car park can be seen at the offices of the City of Hamilton, City Hall and on the web site www.cityofhamilton.bm. “Lighting of the car park will be dramatically improved by the addition of two new lighting columns within the car park, providing 360 degrees lighting and the addition of twelve  new traditional design light columns fitted with LED light heads around the car park. For additional security and peace of mind, three CCTV cameras will monitor the entry, exits and car park itself. “The new sidewalks along Dismont Drive and Victoria Street will be finished in the City’s standard design of concrete panels with red brick cobble border. A new asphalted surface with new bay markings, lane markings and signage will complete the project. “DeGraff’s lunch wagon is pleased to be moving to the south west corner of the carpark at Wesley Square. “From Monday April 18th, the east side of the car park, along Dismont Drive will be closed and a temporary entrance will be available on Victoria Street, in addition to the existing entrances on Victoria and Wesley Streets. “Phase two involves blocking off parking bays on the north side of the car park, along Victoria Street while everything else remains open. Phase three will see work conducted on Wesley Street. Signage will indicate each phase and will direct motorists accordingly. “Drivers will be faced with a barrier arm upon entry and after taking a ticket from a ticket machine at the barrier, the arm will raise allowing access to the car park. “Payment occurs just before exiting the car park, at a pay station, by inserting the ticket into the pay station. Payment methods include cash [coins and notes] and credit/debit cards. EasyPark devices can also be used. How does it work with EasyPark – either device or app? Talk about skimming an article to get to the comments!! I saw that, should have phrased my Q better… How does EasyPark work with this? For example, with the app, how will the gate know to let me out!? Had that same question, I know they have a wireless interface to a base station for topping up or other maintenance, will it work the same, a base station on the way in and on way out?? Hopefully they can provide a better explanation to this process?? Talk about skimming a comment to get to a snarky reply. He didn’t ask IF, he asked HOW. Ok so what if you get through the gate with your entry ticket an then can’t find any spaces? When you try to leave you have too pay? Most places in the US have a short time period where there is no charge. Hopefully we will follow that model. Same as is done elsewhere these type of systems are installed. There is always a grace period for those that change their minds or cannot find a space. Usually around 15min I believe. I am guessing that the entry barrier/system will not issue tickets if the car park is full, and hence you will not face this problem. Then you have back up and potential congestion. The gate system may lead to this anyway. You have a timeframe to exit without charge. In theory, if the system is smart enough, it would be able to know how many cars have entered and keep a live track of the free spaces in the lot. Once the number of cars that have entered into the lot is equal to the number of spots, it would have to enter a one in/ one out process. If it happens that the lot is completely full, it should have a sign that lights up at the entrance to inform users before they pass the gate that it is full. 2 possibilities that I no of in action in other places: the gates know how many spaces there are in relation to how many tickets have been issued and how many have been swiped as exited, where they will register a no vacancy for further issuances; and a grace period of 10 or 15 minutes for you to drive around and look. Maybe even both. Great idea Mayor Charles Gosling,(and others)in seeing this means of recovering funds that were loss over the years and recouping more $ for the future. Or maybe it was just that your comment was not that intelligent. Getting people to pay properly going forward is NOT going to recover or recoup money lost in the past. Parking prices remain the same. It’s designed to prevent loss in the future. Of course that that’s how it works if you believe in a one direction, linear concept of time. Interesting, never realized there was a three hour time limit on parking there. A shame really, perhaps the maximum time should be increased to 4 hours as a base…. Make it two-story and pedestrianize the parking lots on Front Street. Par-la-ville would have been a better candidate for this but, yeah. Must be kept forever as open space. I agree. Build a multi-story car park and get rid of the ridiculous parking on the water front. What a waste? You are also correct that Par-la-ville would have been ideal. A three (or even four) story car park could be built there that would have been barely noticeable. This could have replaced all of the water front lots as well as the blight that is the City Hall lot. It would add no more then a block walk to any destination and could have been paid for by selling some or all of the City Hall lot to developers. Unfortunately, given the state of the economy and the mess that is Par-la-vile, this is a missed oportunity. Agreed. The trees provide some relief from the sea of concrete, as well as providing some shade for a few lucky cars. And does this mean De Graff’s lunch wagon will have to move? They are relocating to the Church / Wesley street side. Near the statue. They are going to take Snowy’s Space?!? Why not just give a designated vendor’s parking space? They pay to be there, it’s not rocket science! Lemme guess. You read comments from anonymous people but not the actual information in the story….. Am I right? What are you talking about? I see what it say. I don’t see Snowy’s mentioned and there isn’t enough space for both trucks. There’s barely enough space for the line at Snowy’s. I don’t think they mentioned Snowy’s but the map shows the new spot for DeGraff’s lunch wagon is at the south west corner of the carpark. Just through the revolving gate near Snowy’s. Can’t mess with those Snowy delights! From what I can see they are not taking the Snowy’s spot. Just moving from the Victoria Street side. To the church street side still in the lot (in front of where they have the metal rotating gate now). That means no more shaded parking unless you get a spot on the perimeter. Its says they are adding more trees though. Add shade and soft landscaping do not “uglify” like this. And why not REPAINT and resize parking bays to fit cars! I’d guess they’d rather try to squeeze as many cars into those spots as possible, sad to say. Is CoH still looking to charge for bike parking down the line as well? I rearly go to Hamilton any more, and this just makes it more easier to not go. You will be surprised the amount of money you save not go town on a Saturday. Don’t support local business, I know they aren’t all in town, but the businesses in town would account for the highest percentage of employed locals, entrepreneurs, and summer student employment in the retail and food service sector. Is there legislation permitting the City to do this? This country is supposed to be governed by laws. Some people think they can do whatever they want because of their last name and pedigree. Give it a break. You’re jumping to conclusions without having done any research, due diligence or have any evidence….again. It is private property, so yes,methyl are well within their rights to regulate the charging, and how they go about the charging for usage of the private property. Just think, if the Dream Team, or maybe it was the Dreamers, had not put the COH in such a hole the current COH could be talking about making the carpoark a multi story & earn some real money with it. I like the idea but what happens when things breakdown as they will and do a lot in Bermuda, is the parking lot then locked down? No you just open the gates until it’s repaired. Simples. If Gov’t just fixed the legislation the City’s been asking for this would NOT be necessary! Tickets don’t stick and clamping no more = people don’t pay! Now we have to suffer lines! OBA or PLP – no difference! If they want move parking spaces for short term parking, dig down 2-3 levels and make a larger lot in the same area. They could even go under the sidewalks for more space. Make an exit tunnel halfway down Queen St. On the top/outside level, have a small green area, with some outside 1 hour parking. This would also help if they even redevelop Par-la-ville parking lot. The “million” dollar question: you got money to pay for digging down 2-3 levels?? Do you have any idea, any idea at all, just how expensive that would be? I still can’t figure out why a lot of people choose to take their cars and pay for all day car parking anyway. $55 for a monthly bus and ferry pass, compared to, what, $200+gas for sitting in a car by yourself? Don’t lose that ticket throughout the day peoples. Then you would be out of luck. How would that work I suggest you leave that ticket in your car. Don’t even think about putting it in your handbag ladies. They should be building a two/three storey cark park instead. They should have built a 2 or 3 storey park at the hospital both the new on Point Finger and the old at the old Emergency entrance so people could have parked and then bussed in to town. and left the garden on the corner of Berry Hill and Point Finger in stead of paying to tar it. It’s an eyesore and not needed. Leaving it your car should suffice. That’s what I do in the states. What about the guys washing cars? We might need a protest here if their rights are infringed. Why isn’t there an entrance off Victoria St? Instead cars have to go all the way around, which only adds to the congestion on Church St. Perhaps move one entrance up to the north end of Dismont Drive so that cars can turn off Victoria onto the short two-way section of Dismont Drive and then into the parking lot entrance. Sorry if this has already been posted – but what about the really HUGE potholes in some areas of the car park? Getting really bad by the City Hall entrance area! Easy Pass could perhaps be modified to work like the Ez Pass System at toll booths in the East coast U.S. The specifics I am sure could be worked out by the technical people in conjuction with management. In Barbados, they have the system and it works fairly well at the two high rise car parks and at the airport. In the capital, I think they even have an incentive system with area department stores, if memory serves me well. It would be naïve not to expect teething isuues, but it can potentially work. I think this is a great idea, recoup the lost money the has been lost over the years due to selfish people that think they are just intitled to park for the day. In comparison to the rest of the world our parking is cheap. I have always felt we should install something similar at the hospital to recoup any pay some of that debt! Them prices way too high !!! You need to cut it!!! Too high?? The fact that a days parking in one the most expensive places in the world can be had for about the price of a Starbuck’s latte suggests to me that the prices should be raised. I don’t have a problem with this option for parking as I’ve experienced similar methods overseas. What I am curious about is whether payment will also be necessary at night where it hasn’t been in the past. Well, and how the heck easypark will work with it, but I expect we’ll learn that in due course. What happens after 5:00pm and on Sundays? For example, on Harbour Nights or any evenings where there may be events going on at City Hall. Will they make us pay now 24/7?